Journey to Bethlehem — A simple trip to pay the taxes becomes a life-or-death nightmare for a new family. A cartoon-illustrated take on the Nativity story. Mindful Webworkshop Episode #16 - Christmas — A politically incorrect and culturally inappropriate Christmas show - pop song parodies and original tunes sure to put coal in my stocking. Joseph and Mary and the Lonely Birth Narrative — It was a little different than the average Christmas lawn display. Let Your Aim Be... — ...to do your Christmas shopping early. Filler ad for 1912 Nov 21. Christmas! 2018 — Videos of the season, top half of playlist is non-music, latter half is music videos. Short and Tall Christmas Day Tales — Seasonal video playlist put together back in 2012. Text, Illustration posted to Best of Spirits on 2018 Dec 25. Text posted to Best of Spirits on 2018 Mar 30. 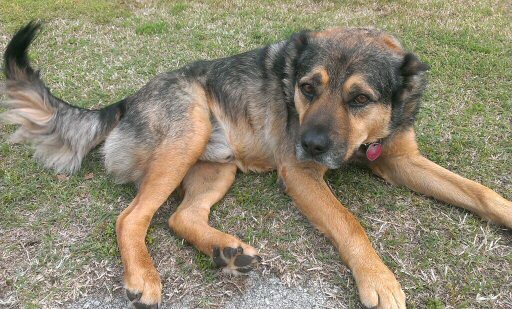 Best dog there ever was, all the way to the end. Originally posted as comments on Ace of Spades Pet Thread, Sat 2017 Nov 4. 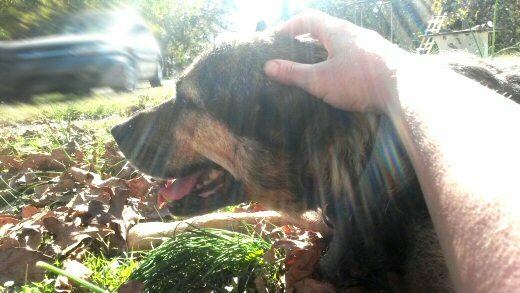 I was a bit premature in announcing our dear dog's death last week. He visited the vet for the last time yesterday morning. I stand on the porch and survey our acres, the acres Gimli knew were his. His territory, as his Queen had taught him. From possum to coyote, cross onto Gimli's territory at your own risk. Deer he tolerated, sort of. All others, beware. And I thought: Who will protect us now? Who will defend us? Who will own us and teach us now? There's no dog nosing the front door open, looking in, and then walking away, as if to say, "come out and play!" Or, as it sometimes seemed, nosing the door open for one of the cats. He was always good at the vet's. He liked the old guy (now retired) and the new gal doctors, and they all liked him. He was always completely cooperative, except for standing on the scale; he never cared for that much. On the way to the vet's we passed a billboard I had never seen before, for a pet crematory. Talk about targeted advertising! When we got to the vet's yesterday morning, he knew where we were, and he struggled to get up and walk in on his own, but we had to bring out a cart and roll him in. After that, he just laid there. I'm pretty sure he knew he was among friends. Even the old doc happened to be in, buying dog food, and got to see Gimil once more. Milady and I, our daughter, and the in-town son (he who, fifteen years ago, was sent out to "chase off that stray dog"), surrounded his bed. He was that great dog all the way to the end. No complaints. He was looking at me, and then there were lifeless eyes. When that Light goes out, it's over. I had to go take a little walk outside before anything else. His collar hangs on the front porch. His smells (good old dog fur, and sickly excretions) still hang around, especially on the front porch where he spent his last hours. I savor it, knowing how quickly it will fade. Not so quickly: stains inside and on the cement porch. Fur, lots of fur, and he was really shedding at the end. Sheets to wash. Old dog mat thrown out. His big food dish... stuck with other retired dog dishes. His favorite blanket... we left with him. Took a walk around the circle drive this morning. First time in ages there was no dog to walk with me. There's a hole in the universe where The Best Dog Ever isn't anymore. ...When Gimli first showed up, Neighbor Bob described him as "not knowin' sic-em from c'mere," and it was true. House-trained, though. So house-trained he always did his biz out in the tall grass, not the lawn. Yesterday, after the vet's, the four of us went out for a memorial-celebratory breakfast at the local greasy spoon. Neighbor Bob and his son-in-law showed up there about the time we were done - an extremely unlikely coincidence. Seemed appropriate. Bob always called Gimli by the name my brother's dog had, when brother lived here forty-plus years ago. "Rattler" was a better country-dog name than Gimli, I admit. I take a walk. No dog runs to join me. The cat food bowls have food left in them. No dog to clean up after them. I open the side door on the car. No dog rushes to jump in. He loved to go places. He loved just being in the car after we got somewhere. His rolling doghouse. I have to mention how he was with my mom. She called him her grand-dog. His eyes would light up when we told him we were "going to visit Gramma." The last time there, he made sure to tell her good-bye, although he probably didn't know it was his last, it was sweet. I'm having trouble seeing the screen. Thanks for the sympathies from folks all the way since last week. • Good Dog Gimli — This attempt to draw him really doesn't do him justice. • Opened Your Mail For You — A True Life Saga co-starring Gimli's feline friend Merlin. Text posted to Best of Spirits on 2017 Nov 5.